There’s a new publication out this week in the lead up to the COP-16 Summit in Cancún, Mexico. 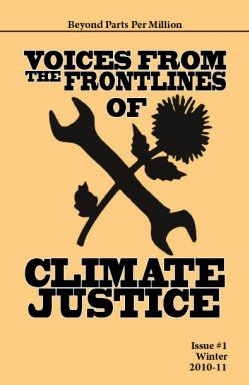 The first edition of Beyond Parts Per Million: Voices from the Frontlines, was put out by the Montréal Climate Justice Co-op today. I’ve written a short article about organizing in Mexico, but there are other great stories in there too! Click here to download the first edition of Beyond Parts Per Million: Voices from the Frontlines of Climate Justice. I’ll be traveling to Cancún in a couple of weeks, and though I don’t plan to cover the convergence, I do hope to update from Chiapas on the implementation of false solutions to climate change and their impacts on Indigenous and peasant farmers.